Roofing Contractor Minneapolis: What is the NRCA? If you’re looking for a roofing contractor in Minneapolis or the surrounding area, you want to know that you’re working with a team that is reputable. After all, it just doesn’t make sense to gamble on something like a roof. As you probably know, the average roof has a lifespan of 15-30 years, and severe weather can cause problems on roofs of all types. When it comes time to repair or replace your roof, it just makes sense to work with a company that you can trust. That’s why we’re proud to say that we are members of the National Roofing Contractors Association, which is also known as the NRCA. What exactly does that mean for you as a potential customer? As a matter of fact, that’s the topic of today’s blog. If you want to know that you’re working with the best of the best, keep reading to learn more! If you take a look at the middle of our homepage, you’ll see an area mentioning the fact that we are fully insured with a business services bond. Beneath that, you’ll see a few badges letting you know what you’re getting when you choose to work with UpWright Restoration Services. When we say that we’re the roofing and siding contractors that you can trust, we want you to know that that’s the absolute truth! That’s why we’re proud to say that we’re a lead-safe certified firm, that we’re an accredited business with the Better Business Bureau, that we’re screened and approved with Home Advisor, that we’re GAF Certified, and more. The fourth badge denotes our membership in the National Roofing Contractors Association, and you can click to verify that this is true. When you do that, you’ll be taken directly to a page on the NRCA’s website that notes that we are verified and that we’ve been a member since June 16, 2017. What is the National Roofing Contractors Association? In other words, it’s there to verify that the things we’ve been mentioning in our blogs are true. At the end of the day, we believe that the truth is crucial and when we say that our goal is to provide you with a safe roof at a fair price, you can count on it to be the truth. 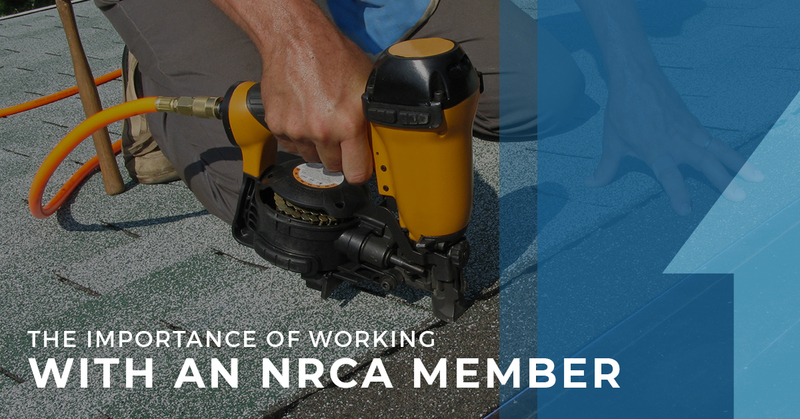 The NRCA badge is only available to current NRCA members and we’re proud to have it listed on our website so that you can move forward with us in confidence that we’ll get things done the right way. If you’d like to learn more about the National Roofing Contractors Association, you can head on over to their website. According to the website, the NRCA is “one of the construction industry’s most respected trade associations and the voice of roofing professionals and leading authority in the roofing industry for information, education, technology and advocacy” and their mission is to “inform and assist the roofing industry, act as its principal advocate and help members in serving their customers.” We’re honored to be included as members. If you’ve been browsing our website, you may have noticed a mention or two of our industry-leading lifetime workmanship warranty. We stand behind the work that we do and that’s part of the reason that we’re members of the National Roofing Contractors Association. It’s also why we’re proud to say that our warranty is one of the best around. We consider it to be a lifelong partnership with our clients that states that we won’t leave them high and dry. When our roofing contractors finish up on the jobsite, you’ll get a call from the co-owner of UpWright Restoration services to make sure that you’re happy with the work that we did. It’s as simple as that. If you have a question about our lifetime workmanship warranty, don’t hesitate to reach out to us at any time because we want to make sure that you are able to move forward comfortably when working with us. That’s what it’s all about. If you’re a veteran or you’re older than the age of 55, be sure to inquire about other discounts that we offer! At UpWright Restoration Services, we build with craft, care, and conscience. Whether you’re looking for a roofing contractor to make your home a safer place or you’re in the market for siding installation, hail damage repair, or window repair and installation, you can count on our team of experts to take great care of you at every step of the way. In our own lives, we appreciate a job well done and that’s what we strive for with each project that we undertake. Learn more about the services we offer and then be sure to contact us today to get an estimate for your next project. No matter the job, no matter the scope, you can count on quality from UpWright Restoration Services.